MTDb – new version 3.0.0 with many new features and improvements is now available! Demo of title page with enabled videos panel can be found here. Easy Installation – Install MTDb easily with no coding or server knowledge in a few minutes with our easy to use installer and documentation. Automation – MTDb can be set to “automated” mode which will automatically import and update news, movies, series, actors and other information from 3rd party sites. Content Management – MTDb can be used as a CMS, it allows you to fully create and modify everything from admin area including movies, series news, reviews, people and more. 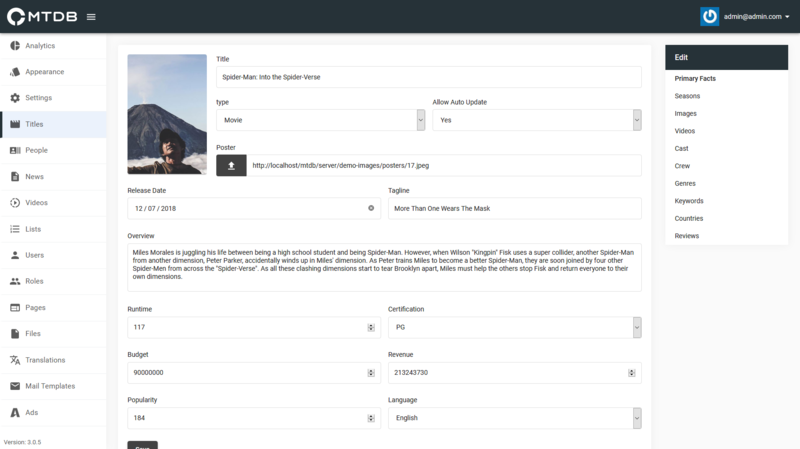 Videos – Various videos including trailers and full movies or episodes can easily be attached to titles from admin area or by regular site users, if this functionality is enabled. Lists – Regular users and admins can create lists of movies, series and people. Automated Homepage – Homepage including slider and all content can be fully automated or populated manually. Search – When “automated” mode is enabled, virtually any movie, series or person can be found via search. Related Titles – Similar titles can be suggested based on title genres and keywords. 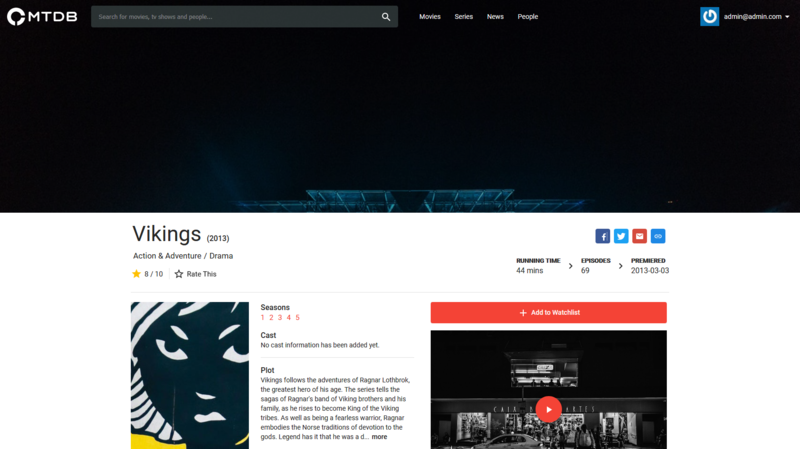 Full Information – MTDb can store and display all information about movies and series, including full credits, seasons, episodes, videos, images, revenue, budget, quotes, release dates and more. User Ratings and Reviews – MTDb includes fully featured ratings system allowing users to rate titles or leave a review along with their rating. Average of these ratings and reviews can then be shown as title overall rating. Browse Page – Browse page allows users to find movies or series based on various criteria, including genres, release date, budget, revenue, language, country, user score, certification and more. Appearance Editor – Easily manage your site appearance (colors, logo, landing page, menus etc) from appearance editor. Ads – Paste ad codes into integrated ad slots in admin panel and MTDb will display them automatically. Ajax Based – MTDb is ajax based application, which means it’s faster when a regular site and has no full page reloads when navigating between pages. Roles & Permissions – Assign roles and permissions to users to give or restrict access to specific functionality on the site. Analytics – Google analytics are integrated right into admin panel so you don’t need to open a separate page to see how your site is doing. Translatable – Site can be easily translated from admin panel, it also has multi-language suport. Responsive – MTDb is fully responsive and will work on desktop, mobile, tablet and other devices. Documentation – MTDb comes with in depth documentation that explains everything from installation to all the features. Authentication – Fully featured authentication system with social login (facebook, twitter and google), normal login, registration, password recovery, account settings and more. Disable Registration – Registration can be fully disabled from admin panel so only users you create manually from admin panel will be able to login. Professional Design – Pixel-perfect professional design based on google’s material design. Settings – Admin panel has many settings that allow you to fine-tune the site to your needs. Multiple Homepages – Choose between multiple homepages including landing page, login page or your own custom html page. Source Code – You will receive full, unencrypted source code upon purchase, allowing easy custom modifications.